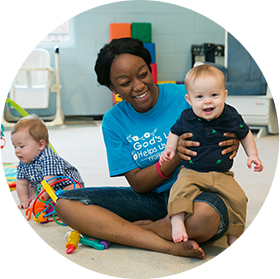 The Nursery Ministry at Thomasville First United Methodist Church seeks to provide a safe, Christian atmosphere for the youngest members of our church family. We hope that our loving care for the children will allow our members to participate in the multitude of opportunities available here at TFUMC. Nursery is available for children ages 6 weeks to 3 years old on Sunday mornings from 8:30 am until 12:15 pm during our Worship Services and Sunday School. Nursery is also available on Wednesday evenings during Church Night Supper (CNS) from 5:00 pm to 7:15 pm. As our church grows and welcomes visitors each week, we pray that our Nursery is always a welcoming, inviting place for parents to leave their children while they worship, learn and serve. Please contact Lisa Knapp, Nursery Director, with any questions you may have.